This simple combination of ingredients gives your adrenals a hug with the nutrients they need! Why drink a nourishing adrenal cocktail recipe? Any stress, whether as a result of emotional, environmental or physical causes, is a heavy burden for your adrenals, two little glands perched on top of your kidneys play a large role in balancing your hormones, managing your weight (especially around your middle), insuring uninterrupted sleep, keeping your mood steady and keeping your immune system strong! This nourishing adrenal cocktail is the perfect balance of fat/carb/protein for adrenal health and blood sugar balancing. I describe it as a “hug” for your adrenals in the middle of a stressful morning or a stressful day. WHAT’S IN THE NOURISHING ADRENAL COCKTAIL RECIPE? Vitamin C: Fresh squeezed orange juice gives your liver the glucose it needs to regenerate. · Guess where the highest concentration of vitamin C in stored in your body. Yes, the adrenal glands! They NEED it! · Your adrenal glands use vitamin C to make all your adrenal hormones, most famously … cortisol. · When you experience stress or a stressful situation, your body’s vitamin C is rapidly used up to make the cortisol and other stress-response hormones your body uses to deal with stress. · If your adrenals are fatigued, they “freak out” if they are missing vitamin C and actually release MORE cortisol. It may seem like a head scratcher, but really they are trying to get your attention. Sadly, if that flood of extra cortisol state keeps going as you experience stress after stress with no vitamin C, your blood sugar gets our of wack, your blood pressure will go out of balance, and it end up accumulating belly fat around your middle (more on the science behind that in another blog!). 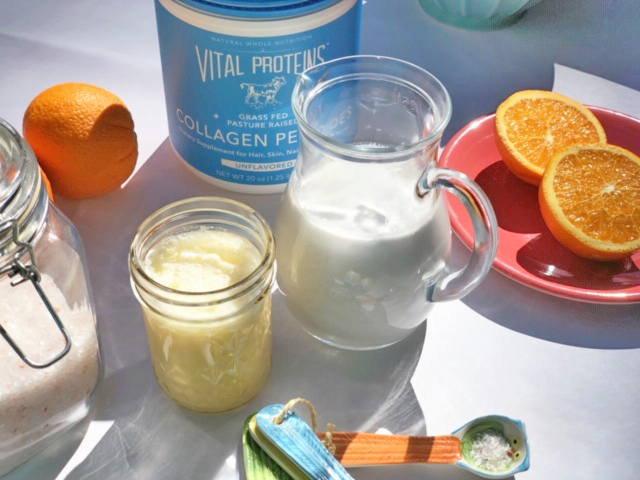 Collagen: Collagen is loaded with the amino acids and building blocks for health. · Himalayan pink salt has 84 essential minerals that the adrenals need to function properly (this is very different from iodized table salt, which can be harmful to your body). Don’t substitute other salts for the best effect. Note: You can substitute low fat if you have a problem digesting fat, but in general, this is key for satiation and blood sugar stabilization. 2 Tbsp organic, grass-fed cream (or coconut cream). Blend it up into a delicious creamsicle (especially if you add a few cubes of ice to chill!) and drink 1-2 times a day an hour before or after food. Take the adrenal cocktail around 10 am & 2 to 3 pm, on an empty stomach (an hour after & before food is best). 10am and 2pm are the times when the adrenals are depleted of minerals and need to be replenished. However, it is more important for you to simply get the drink into your day. So don’t skip it because you think you missed the “perfect” time to drink it!